I was recently at a client demonstrating how we had set up Jira and someone said “wow you changed Jira issues to Jira items”. That’s great but it actually holds a very valid point. I have commented on this before but of course Atlassian has a generic name for issues. These are the atomic units of Jira. In reality they aren’t issues – they’re whatever you happen to be managing. In the case of Agile, issues are actually epics and stories. Issue types are also bugs or defects. 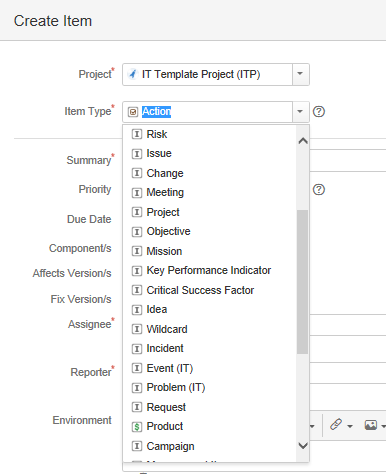 In our Jira we used the language pack to trick the application to rename issue on the menu bar to item. This is because its consistent with the idea that we manage items, not issues. Our philosophy is that items are managed such as deliverables and issues. In addition to problems, objectives, incidents, in fact it is whatever you need to manage. In later blog posts, we will discuss many of these management items. The key point is to be aware that you can configure Jira to manage pretty much anything! In conclusion, Jira issues don’t have to be issues after all. To find out more about how you can configure Jira to work the best for you, contact us!